Description: Two SD40-2 killers lead #203 at Grand Crossing. Notice the empty ditch light brackets. Description: A westbound freight rolls past Grand Crossing. Description: Train 561 backs past the closed Grand Crossing tower. Once in the yard they will pull west onto the BN for a detour due to track/CTC work on the SOO. Description: SOO train 561 heads west on the BN at Sullivan. They are detouring due to track/CTC work on the SOO. Description: This church has seen more rail action that most of us ever will. It makes a great photo for a passing 261 on a snowy day. 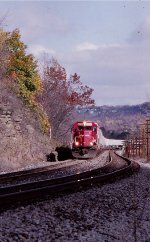 Description: Train 261 rolls along the Canisteo River behind the usualy pair of SD 60s. Having a red on leading really makes for a festive look. Description: A 261 train rolls around the big curve going into Canaseraga as seen from the NY 70 overpass. The Erie once had grade separated mains here, the eastbound being higher. That track was abandoned when Conrail single tracked the line in 1992. The view from up here is stunning on a nice day. Description: Train 261 passes one of the semaphores that guarded track 1 til it was taken out of service the year before. The Canisteo valley was up til then one of the best places to see them still in service. Some would last into the 21st Century elsewhere on the line. 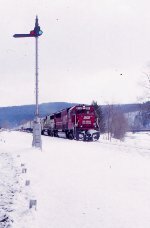 Description: SOO 6050 leads train 261 west around Rattlesnake Curve on a snowy Saturday. Title: SOO LINE SD60 NO.6030 PROVO,UTAH MAY 13,1995. Description: Two Soo Line SD60's make a rare appearance in Provo on Union Pacific's Hinkle,Oregon-Yermo,CA Manifest. This track the train is has since been ripped out to make way for Utah Transit Authority's ''Frontrunner Project''. UP trains coming in and out of Provo now use the former D&RGW Mainline. Title: UNION PACIFIC'S HINKLE,OREGON-YERMO,CALIFORNIA MANIFEST AT PROVO MAY 13,1995. Description: Union Pacific's HKYR performs switching duties at Provo before heading west towards Lynndyl on Union Pacific's Provo Subdivision (Now Sharp Subdivision). Two rare Soo Line visitors make an appearance in the form of two SD60's. Description: Train 261 rolls past the semaphore on track 2 at Barton. This one would last into the 21st century. Description: The trees are usually bare by November-peak in the Tier is usually the second week of October-so it was a treat to get one tree left in color. Description: Actually it's the leader that's the old unit, a straight SD40. The Soo unit is only 13 years old at this time, a relative youngster on CP's roster. Description: A pair of SOO units are in todays 413, a common sight on this train, seen passing the Agway mill at the south end of Bevier St. Description: Grain goes past Interstate on the BNSF. 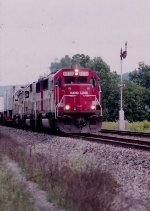 Description: HIghballing a westbound mixed freight on the NS mainline at Pine Junction. Description: A pair of SOO line SD60 rolls K869 under the Fifth Ave. bridge at Manchester, GA. Description: K869 splits the signals at N. Woodland going into the siding. Description: Basking in the morning sunlight at Woodland. Description: After being involved in a grade crossing accident, CP put new SOO LINE text on the nose, and also painted a few areas (one visible panel is the one under the number) back in SOO red! What class! Description: Lone SOO SD60 6030, with its unique italicized nose lettering (the result of repairs from a collision with a semi) leads train 889 toward LaCrosse late on a sunny summer afternoon. Description: EB on the NS Lehigh Line, 18th Avenue, 0743 hours.